Being clean and smelling great should never mean using manufactured, toxic substances that you will inhale and absorb. If you insist on wearing a scent or scenting a space, please consider these ways to smell fresh while going fragrance-free. Fragrance is the new second-hand smoke. Being clean and smelling great should never mean using manufactured, toxic substances that you will inhale and absorb. Think about it: if you climbed to the top of a mountain and took a deep breath of fresh air, compared to a deep inhale of a "mountain fresh" home cleaner or scented candle, you would notice a difference in how it makes you feel, right? We are conditioned to understand that littering is bad, and that pollution is toxic -- but using fragrance in your home (or workplace, or on your body) is also polluting our shared air and world. 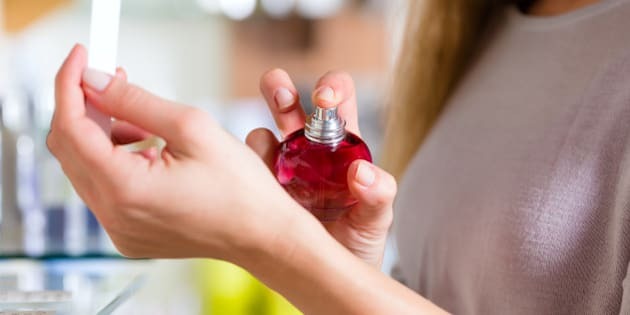 Whenever you buy products with fragrance, you are telling companies to keep making it (and those involved in the manufacturing are affected terribly as well). If you insist on wearing a scent or scenting a space, please consider these ways to smell fresh while going fragrance-free. Get clean using water and products that are free of parabens, phthalates, synthetic fragrances and other yucky ingredients. Remember: being truly clean is vastly different from the synthetic scent that big companies call "clean." Understand that sweat is not the enemy. Here's the down low on B.O. : one square inch of your skin has about 650 sweat glands that need to be free and clear to get on with their important jobs. Most antiperspirants work by blocking, clogging and closing your pores with powerful astringents so they can't release sweat. But you want to sweat (you NEED to sweat) -- it's the body's natural cooling process and aids in detoxification by letting the toxins out. Eco products can still prevent B.O. with natural antiseptic agents. Find your signature scent and skip the headache-inducing synthetic fragrances. Try an organic perfume from The Detox Market or an aromatherapy body spray from Love North. Routine makes 12 deodorants with three different formulas (vegan clay, beeswax, and clay and beeswax), with gentle, organic, natural smells. They even have some options that are free of essential oils, making them friendly for those with allergies. For more deodorants that work, see our guide here. Your home is important. Keep the place you live, eat, play, sleep and breathe free of harmful chemicals and artificial fragrances. Swap out conventional cleaning products for nontoxic cleaning ingredients like baking soda, castile soap (try Green Beaver's which is made from organic Canadian ingredients), vinegar, lemon juice and essential oils (we love Living Libations which is organic). The best air-freshener is actually FRESH AIR. Air fresheners don't remove odours, they simply mask them. Open the window before reaching for a spray. When your favourite bouquet of organic flowers is starting to turn, use the flowers to make your own DIY potpourri! You can customize the scent by adding some organic citrus fruits and whole spices, too. Fill your living space with the soft scent of your favourite organic essential oils using a diffuser or nebulizer -- it won't just smell good, it will boost your mood and relax you too! Bottom line: fresh air doesn't actually smell like anything. You shouldn't smell cleaning chemicals or other people (at the restaurant, theatre or park). The best fresh air comes from the great outdoors, and your best scent comes from a clean body and confidence.